The present General Contractual Conditions (hereinafter referred to as General Terms and Conditions) regulate the commercial relationship which could occur between SUBIBOR SL, (hereinafter referred to as PROTUR) and the user or client for any contract undertaken using the documents at their disposition in https://protur-hotels.com. A booking made on the Protur website establishes express acceptance by the client or user of the pages of these conditions and also the conditions of use established for the navigation of the user of the pages which are the property of Protur. These conditions shall apply without prejudice of the application of the legal regulations of matters that are of application for each case. The present General Terms and Conditions are subject to Law 7/1998 of 13th April, regarding General Contractual Conditions, Law 26/1984 of 19th July, General for the Defense of Consumers and Users, Royal Degree 1906/1999 of 17th December 1999, by which is regulated Contracting of Telephone and Electronics with general conditions, Organic Law 15/1999 of 13th December, Personal Data Protection, Law 7/1996, of 15th January for Ordination of the Retail Trade and Law 34/2002 of 11 July, for Services of the Society of Information and Electronic Commerce. Protur reserves the right to undertake the modifications considered necessary of General Terms and Conditions, without previous notification. These modifications can be made via their websites, in any legally admissible format and will be obligatory during the time that they are published on the web and up until they are subsequently replaced by other valid conditions. Nevertheless, Protur reserve the right to apply, in specific cases, Special Contractual Conditions in preference to the present General Terms and Conditions where considered appropriate, announcing them in due course and manner. Protur informs that the reservation procedure via the web pages, is detailed in the paragraph called Reservations. Also, Protur informs that the user can have access to the conditions by clicking on the Legal Notice section. After making a reservation, the user can visualize the booking confirmation on the screen, with the option to print this screen as the confirmation of the reservation effected. The confirmation of the booking and the supporting document (printed by the user) are not a valid billing document. As a general rule and unless an alternative is expressly agreed, the rooms are available from *12.00 hrs. on the day of arrival and should be vacated before 12.00 hrs. on the day of departure. The reservation will be guaranteed up to 18.00 hrs. on the arrival day, therefore, if the user is planning to arrive at any other time, please communicate as soon as possible the exact arrival time. *Protur Naisa Palma check-in at 2:00 p.m. The offers are valid only during the period stated and with the conditions published by Protur or in this defect, during the time that they are accessible for clients to contract. Protur reserves the right to check the fulfilment of these conditions in order to apply the offer. All possible bookings will have a price indicated incorporating IVA tax or any other possible tax that could be applied. The prices indicated on the screen are those that prevail at that moment, except in the case of typographical error. When the price is different, for the reason previously stated, Protur will communicate this to the client by email before proceeding to collect payment for the booking. As a general rule, the price of the booking includes exclusively, room only, room with half board, room with all-inclusive or room with breakfast. The availability and price of special requests such as: necessity of a cot in the room, extra bed, etc. that cannot be included in the calculation of the booking on line, will remain pending confirmation from the hotel and this will subsequently be effected by telephone or in writing to the client. To access the discounts corresponding to age, you must provide proof on arrival at the hotel (ID Card, passport or Family Record Book). The end of the reservation and final total calculation include I.V.A. or I.G.I.C. unless expressly stated otherwise. Any other possible tax that affects the final price, will be paid directly to the hotel. Availability of the Protur offers on their web pages can vary according to client demand. Although Protur periodically update their database, the booking requested by the client may not be available because the hotel is fully booked at that moment. In that case, Protur will send an email to the clients informing them that the offer is no longer available. When you make your booking on line and in order to receive confirmation, you will be asked to pay a minimum of 10% of the total amount if you pay with a credit card or a minimum of 25% of the total amount if you wish to pay the deposit by bank transfer. Any bank charges are the responsibility of the client if they choose to pay by bank transfer. The remaining amount should be paid directly to the hotel on checking in. (Except bookings with any special conditions).Payment of the remaining balance can be made by bank transfer or credit card ( always with the corresponding form/authorization by email). The remaining balance can be paid in a maximum of 3 installments and for a minimum of 600 euros per payment. Payment by bank transfer is only available for bookings of 10 days or more before the date of arrival. If the transfer is not received in a period of 5 days Protur reserve the right to cancel automatically the booking. Bookings with special conditions or tariffs Non Refundable. Prepayment of 100% of the total booking. Modifications are not acceptable and in the case of cancellation for any reason, the amount paid is non refundable. Cancellation of a booking. Any booking already made can be cancelled via email to info@proturhotels.com or via fax to +34 971 585 157 indicating the reference number. In the case of a cancellation with arrival in less than 24 hours or no show at the hotel, Protur will charge for one night's accommodation and cancel the reservation. Bank charges generated by cancellation of booking are the sole responsibility of the client. A bill will be produced and sent to the address given by the client on registration. Modification of reservation. The booking can be modified after confirmation via email to info@proturhotels.com or via fax at +34 971 585 157 indicating the booking reference number. The success or otherwise of the modification of the booking will depend on the availability that Protur have at the time of the petition. The modification could generate an increase in the total price of the booking, for example, a change of dates or type of accommodation, etc. A second modification or more of the booking made by the client will generate an extra charge of 6€ administration fee for each change. We would like to inform you that the Balearic Parliament has introduced a new tourist tax applicable to stays in tourist accommodations located on the Balearic Islands. The tax will enter into force next 1st July 2016 (Law 2/2016 on the Taxation of Tourist Accommodation on the Balearic Islands). During low season (between 1st November and 30th April of the following year) the tax will be discounted by 75%. In addition, after nine days of any stay, the rate will also be cut by 50%. Children under the age of 16 are exempt from paying the tax. Therefore, any natural person (over the age of 16) staying in a tourist accommodation on the Balearic Islands is obliged to pay the before mentioned tax to the owner of the establishment where he/she is staying. As a result of that and of our obligation to pay the tax to the tax authorities of the Balearic Islands, we hereby inform you that, in compliance with the current Law, we will proceed to charge you the above mentioned tax before you check out. The money collected from the tax will go to a fund promoting sustainable tourism. The money will be used to fund projects encouraging a sustainable, responsible and high-quality tourism model, particularly projects that boost the preservation of the environment (nature, country life, agriculture and sea life), off-season tourism, historical sites and cultural heritage, research and development, education and employment. The projects will be selected by a Committee for Sustainable Tourism Promotion made up of representatives of the Balearic Government, Island Councils, City Councils, economic and social stakeholders and other organisations. The job of the Committee is to draw up an annual plan and set the key annual goals according to specific territorial balance criteria. In case you have any questions regarding the new tourist tax on the Balearic Islands, you can contact the Balearic Tax Agency by calling at 901 201 530. - The price of our products is expressed in euros and includes VAT. IMPORTANT: No shipments are currently being made to the Canary Islands, Ceuta or Melilla. Delivery takes approximately 8 days for mainland Spain and the Balearic Islands. This is an estimate and may take longer at busy times of the year. - Recipients of certain gift vouchers may be required to meet certain personal conditions such as age, health status, etc ... These conditions can be consulted in the product description or by contacting the supplier of the activity. - Arriving late for the booked activity included in the gift voucher may result in less time being available for the activity or it having to be cancelled. This will result in the forfeit of the gift voucher. - Should a service on offer be used that is but not included in the gift voucher, this service must be paid on the spot. - Once the gift voucher has been bought, in no case will the amount corresponding to the purchase be returned. - In order to enjoy the gift voucher, a reservation must be made at least 48h in advance. - Once the reservation has been made, no cancellation will be accepted. It can be exchanged but only in such a way as to cause no prejudice to Protur hotels. - Gift vouchers are valid up until the expiry date stated. This cannot be extended. Non-use of the gift voucher does not warrant a refund. The same accommodation can be in different gift vouchers with different tariffs, be it for the different type or rates of its rooms or apartments. Protur Hotels pledges to book the accommodation type that corresponds to each gift voucher. - The Gift Voucher is subject to availability. It must be handed over on arrival at the establishment. It is essential when making the booking to say that you wish to redeem a gift voucher and indicate the reference number. - Protur hotels reserves the right to change the rates without prior notice but guarantee to respect the price paid at the time of buying. - In the case of gift vouchers that include accommodation, the price does not include the Balearic Islands tourist tax that is applicable in accordance with Law 2/2016. 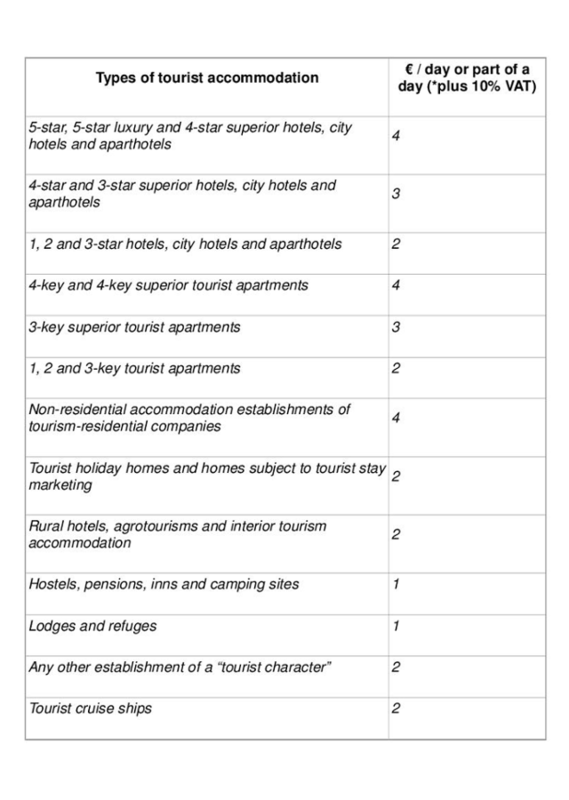 The amount to be paid varies according to the category of the hotel. This tax + VAT, must be paid by guests directly to the hotel reception on arrival. *All information provided to the client by the company is binding for the supplier under the terms established by consumer protection legislation. *All users of touristic services have the right that all services and goods acquired are of a standard of that legally contracted and that the quality is proportionate with the category of the touristic establishment. *All the establishments have the obligation to have at the disposal of the client a complaint's book. To formulate a complaint the client must request the pages, fill in their personal details and indicate clearly the motive of the complaint. *Pay the price of the contracted services, the presentation of a complaint or reclamation does not relieve the client of this obligation. *Observe the rules regarding hygiene, education and good relations with the rest of the clients and staff of the chosen hotel. Protur reserve the faculty to present civil or penal actions that they consider necessary for the unauthorized use of their website and content or the breach of the present conditions. The relation between the user and the supplier is governed by present legislation applied in Spanish territory. Should any controversy occur between the two parties, the conflicts can be settled by arbitration or by ordinary jurisdiction fulfilling the rules of jurisdiction and competence. Protur are domiciled in BALEARES, Spain.